There’s a moral in the lines above from the Billy Higgins chestnut “There’ll Be Some Changes Made,” and no arts venue in the Metro knows this more than the Bemis Center for Contemporary Arts. Within the past year, Bemis has seen the departure of key staff including former Director Mark Masuoka, Chief Curator Hesse McGraw and Underground Director Joel Damon, all of whom are prospering in new endeavors of their own. Meanwhile, this arts venue has weathered the changes going forward under new leadership with Director Adam Price and the expected addition of a Director of Arts Programs by the end of this year. As if taking his cue from the hit song, Price’s experience with the DIY 337 Project and as former director of the Utah Museum of Contemporary Art, both in Salt Lake City, promises to change the way Bemis “struts its stuff.” And, with no less than its key fundraising event, the annual Bemis Auction, arguably the most anticipated visual arts event in the Metro area. This 15th variation on a theme of social celebration and fundraising will open, climax and close the same night, this Saturday, October 26, from 6-9pm. As in the past, the evening will feature a silent auction, refreshments catered by the Boiler Room’s master chef, Paul Kulik, and a live auction all included in the price of admission. About that cost. Director Price says the increase from $25 to $99 has an added value. Recent auction proceeds have grossed approximately $500,000, or about 25% of its operating budget, and that continues to be Bemis’ goal. But annual fundraising events that don’t adapt to changing times and the economy can suffer their own success…or even excess. For example, despite meeting last year’s goals, the silent auction left close to one-half of the work unsold or un-bid-upon. And, as reported in the Reader, patrons were not comfortable with Bemis’ use of a digital bidding system, which hampered the process as well as the usual social vibe. To that end Price has initiated other changes in the auction that downsize– read streamline–the event with patrons and participating artists in mind. Gone is the digital process. Bidders will queue up to the art, elbow-to-elbow and shoulder-to-shoulder as before, but there the similarity ends. Besides reducing the silent event to one night, main floor only, Price says “there are fewer artworks this year, so we do expect the bidding to be somewhat more competitive, which is part of our effort to ensure that artists are receiving a fair return for their contribution. Ferguson thinks that the huge number of works up for bid in the past was “detrimental to both buyers and artists” and is hopeful that “the quality of works has been increased.” Another participant, photographic artist Larry Ferguson agrees but says collectors “would do themselves a big favor by going to the event with knowledge on their side, having done some research about the art and the artists. The live auction also gets special attention with Christie’s auction house conducting the bidding which features several experience packages including three-night stays in New York and Chicago that offer museum tours and visits with notable artists such as the former’s Betty Woodman and the latter’s Theaster Gates. Though the display of artwork for the silent auction continues in Bemis’ necessary salon style, individual works do seem to breathe easier under the nearly clinical bright lights, as they seem to virtually pop from their white backgrounds. The silent segment will close in three sections between 7:45 and 8:00pm as before, but it will be interesting to see how the anticipated 400-500 bidders maneuver from the larger spaces of Gallery 2 and the hallway into the smaller Gallery 4, formerly the art sales space or vice-versa. Nevertheless the show is interesting itself with a revealing mix of familiar artists and new. It’s difficult to discern a curatorial scheme in a display of this size, something that former curators Jeremy Stern and Hesse McGraw worked hard at to establish, but certain visual clues and motifs make themselves apparent this year for the sake of viewer comparison/contrast. For example, there are: several hand- and laser-cut works on the east wall of Gallery 2 from Laurie Frick and Natasha Bowdoin, as well as Susan Knight’s intricate piece, “Merge,” in her signature style; a preponderance of mixed media throughout such as pieces from Chinatsu Ikeda, Michael Todd, Shannon Rankin and Scott Blake; and distinctive totem-like sculpture from Liz Vercruysse, Troy Mueller and Deborah McColley. Several intriguing juxtapositions or conversations can be appreciated including the “totems” above as well as child-like sculptures of Claudia Alvarez’s old-before-their-time “Nina Pendencia” and the gremlinesque creatures in Santigo Cal’s “Breathings.” Note also side-by-side contrast abstraction of Mary Zicafoose’s monoprint, the sharp, angular “Mountain with Ghosts” and Mary Day’s appropriately titled, cyclical acrylic “Continuum,” in Gallery 2 and the multi-layered striated abstraction in Mary Ann Strandell’s colorful “Red Wave” and Deborah Murphy’s graphite drawing, “Convoluted Convergence” in Gallery 4. There are no such deliberate constructs in the only 10 works in the live auction, but one can’t help but notice: the relationship of Jun Kaneko’s two, perhaps unintended companion pieces, the 2003 untitled “Hawaiian Drawing” and the subsequent “Untitled” Dango (2011), which shares a similar contrasting dark and colorful palette and dripping geometric pattern. 1. Kim Reid Kuhn’s “Exposure,” an abstract expressionistic, mixed media that in uncharacteristically restrained and all the more effective and aesthetically pleasing because of it. 2. Larry Ferguson’s “#161-63, Hollywood, CA, a darkly, fragmented and unglamorous photographic cityscape from someone perhaps best known for his romantic idealism. 3. Also unexpected is Peter Cale’s 3D, wavy and all white, textural wall hanging, “Gladys’ Brain,” a hand-cast plaster made from a wooden original, his more familiar métier. 4. Another “wall sculpture” of significance, “Dry Times,” a mini installation of sorts in ceramic and rope. Artist Jess Benjamin is dealing with water/environmental issues, but here with a more industrial and witty point of view. 5. Doug Boyd’s outsider mixed media, “Portrait of Paul Konchagulian,” a clever, sophisticated “boxed set” that belies its naïve style. 6. Joe Broghammer’s chalk and pencil “Mike’s Cartesian Theater,” a wisenheimer snow owl, embedded with witchcraft and supernatural iconography and secrets, maybe indicating the artist’s return to a more provocative mise en scene. 7. Brittan Rosendahl’s audacious, leggy “Discarded Red Shoes,” an archival print that is deliberately irreverent. Not contrasting Madonna and Child portrait above fireplace. 8. Amy Brener’s paradoxically ruff-hewn and iridescently delicate “Miniport” sculpture of resin, glass and pigment resembling, yet transcending a large shard of crystal beauty. 9. Iggy Sumnik’s ceramic vessel, “Spotted,” referencing either and underwater piece of coral or surgically removed stomach minus a valve or tube. Either description of this organic, whimsical work would probably please this imaginative sculptor. 10. More figurative, but equally bizarre is Gerit Grimm’s ceramic fairy tale interpretation of “Lady Godiva” that is an exquisitely complex and outré send-up of the folk legend. 11. Leslie Iwai’s “Colonies Collapse,” an abstract, ephemeral, mixed media decomposition of the most unusual nature in black and white. Iwai takes and gives great pleasure in repurposing found object and this salt on tarpaper is no exception. 12. 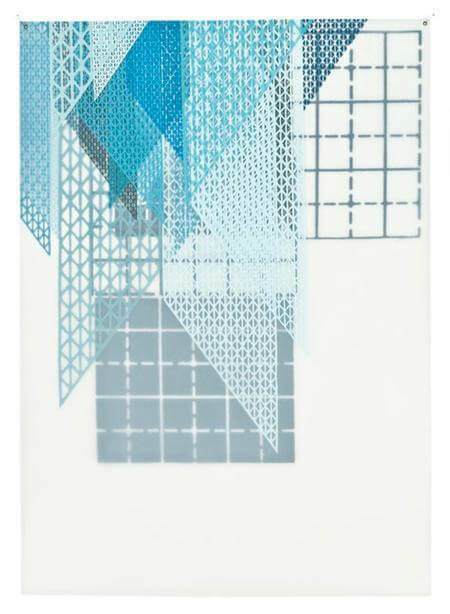 Amanda Knowles’ “Pinned IV,” a screen print of an intricate graphic pattern of shades of blue and gray…a sharp contrast to the busy, heavily textured works surrounding it, this is a welcome relief so subtle sophistication. 14. Jarrod Beck’s avant garde ink on a shredded roll of paper, “Itinerary,” whose particular aesthetic not only challenges the viewer for its own sake but the very notion of what is art itself. 15. Kristin Pluhacek’s “Topiary,” in pastel and charcoal, an intriguing take on Nature’s paradoxical transition of change and stability. 16. Jennifer Balkan’s “My Turn Now,” a beguiling oil on wood for its disarming simplicity and contrasting point of view revealed on the faces of its two protagonists. 17. A rare piece of fabric art in the auction is Leslie Ellen Diuguid, “Sandy…Too Soon,” an effective experiment in mixed media that revels in its tale of tragedy at sea. 18. Brion Poloncic’s “Untitled,” a meticulous ink drawing of twisted vision whose iconography conceals far more than it reveals. 19. Brandon Juhasz’s “Bros,” an archival jet print of two brothers in fist bump that should have broad appeal for its “Toy Story” single cell style of animation. 20. There is no more avant-garde piece of sculpture in the auction than Jar Scheper’s “Catalyzed Chrysalis” of recycled materials, a larger than life ominous creature of cinema in the 50s that does justice to Vincent Price’s “Tingler” or most any Jack Arnold sci-fi flick. The 15th Annual Art Auction, this Saturday, Oct 26 from 6-9 p.m. at the Bemis Center for Contemporary Arts, 724 S. 12 St. For details go to bemiscenter.org.